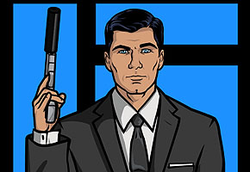 Sterling Malory Archer is one of the world's most dangerous spies. He is a loose cannon. Any mission Archer undertakes, it will have its fair share of violence and mishaps. Pairing his alcoholic and egotistical personality with a mastery of weapons, martial arts, and driving, leads to a life full of thrills, near death experiences, and questionable decisions. Without a doubt, it is always captivating to watch what Archer will do next!